Life is weird. One day you’re enjoying an ice cold Coke and you have no clue that it will be your last one. I remember it specifically, it was a Saturday night, August 1st. Hubby and I were finally headed home from a late afternoon of errands and we grabbed carry-out on the way home. I ordered a large Coke, my favorite. It was so good. The next day, I didn’t have soda at all. We rarely have soda in the house, so this wasn’t odd or out of sorts. The day after that, I didn’t have soda again. I wasn’t purposely not having any, I just wasn’t having any. The day after that, 3 days since I last had a soda, I decided I was going to try to go as long as I could without soda. Suddenly, I wanted to be soda free. Somehow this seemed totally doable. My downfall with soda has always been eating out. Lunch at a restaurant or on the go? I’ll have a Coke please and thank you. Same thing with dinner out, if I wasn’t having a glass of wine or beer. Having pizza? I guarantee I was having a soda with it. I have had ups and downs with soda over the years. In my teens, I drank ALOT of soda. Easily several cans a day. In my twenties, when I went low-carb for a year, I cut it out except for one or two a week. Then I started drinking it again. In my 30’s and my first time with Weight Watchers, I cut it out again, except for once or twice a week. I usually saved it for the weekend when we eat out. It was a treat. Then again, I started drinking it more. A couple times a week became several times a week. Within the last year, I was probably having one daily, sometimes two. I never, ever drink diet soda. To me, diet soda is so gross and has an awful after-taste. It’s also worse for you than regular soda. If I was going to have Coke, it was going to be the real thing. Nothing with the word “diet” or “zero”. Nope, not for this girl. After I went 3 days without it, I knew that it was a change I needed to make. I have no business drinking soda that often. And if I tried to limit to the weekend, it would creep back in again like it always has. Day 3 of my no soda streak turned into a soda free quest. 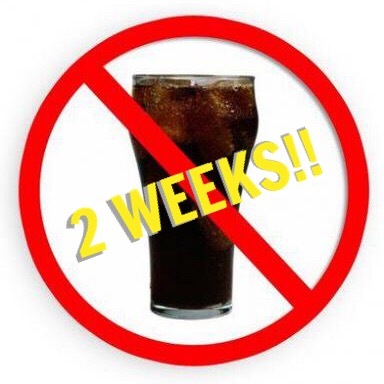 As of today, I am two weeks – 14 days – without soda. I really wanted soda on days 5 – 7 of this quest. But I didn’t cave in. I knew I didn’t need it. I never really had headaches when I stopped it because I was still having my morning coffee for my caffeine fix. But then other little changes started happening. I realized I wasn’t as hungry throughout the day. Perhaps all the water I’m drinking – 5-7 bottles a day – is really doing it’s job in helping to keep me full. I’ve also haven’t been craving junk food nearly as much. I also started making better choices when ordering meals out. Such as skipping the bun on a sandwich, having coleslaw instead of fries, or skipping the free ice cream at Jason’s Deli at our once-a-week lunch there. I know that all of these little changes over time will make a difference. My drink of choice is water. I feel like I can never drink enough water. I also love unsweet ice tea with lemon. Have I lost weight? I feel like I have. I don’t feel as bloated as I have been feeling for quite awhile. But I have no idea what my weight is, so I have no numbers to compare today vs. two weeks ago. That will change today, though, when I get on a scale for the first time in probably 5 months. I have decided it’s time to have a scale back in our house. It’s been 9 years since we’ve had one but we need one. I need to know where I’m at so I can continue to work towards goals that have setback due to poor food and drink choices for too long. Ironically, I feel like if I woke up one morning and said that’s it, no more soda, I never would have been able to do it. I would have felt like I was depriving myself of something I enjoy. After kind of working my way into it like I did, it seemed much easier. Maybe mentally I knew what I was doing. I have no idea. All I know is I feel SO much better without soda in my diet. And after not having it for two weeks, I know that absolutely do NOT need it. Are you soda free? 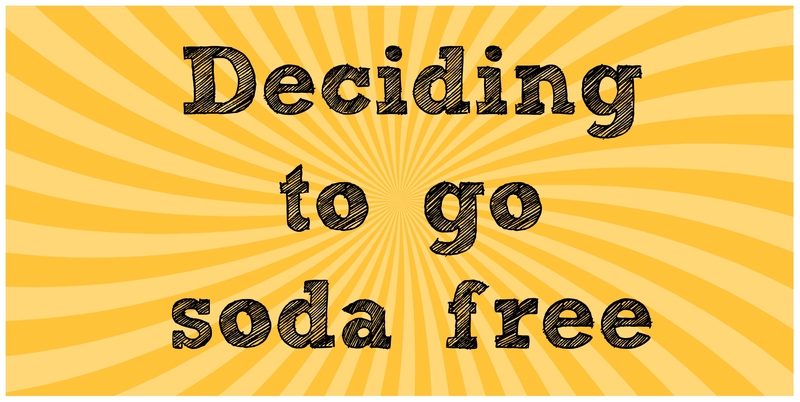 What is one way you combat soda cravings?